Fully refurbished HP Laserjet IIID, please also check below for the accessories we offer for the model IIID. If you have any questions feel free to Email, FAX or Call us. We also offer REPAIR service on this model of printer, if you wish to have your printer Repaired please Go Here. Recommended for printing any text documents, small to medium spread sheets, small to medium forms, and small graphics up too full page. Series III laserjets do handle large graphics somewhat better then the series II, we still do not recommend this printer for graphic based printing of such things as webpages with lots of pictures/graphics or documents with many large graphics. 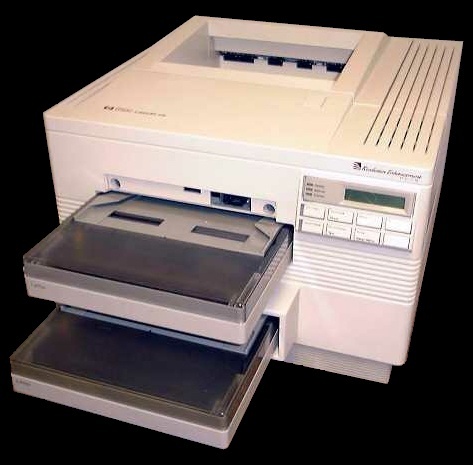 The laserjet IID is great for the small office to large office. One of the most cost effective forms of printing news letters, double sided forms, etc. Has two paper trays allows it too hold twice the amount of paper as the model IID, also allows you to hold two different sizes of paper. Similar to the laserjet IID series with some exceptions. One of the biggest changes in the series IIID laserjets is the introduction of RET technology, which in effect doubles the resolution of the print to 600x600 DPI. Other changes included increase of built in memory too 1MB and a slightly faster internal processor on the printer. The faster processor allows the printer to process larger documents and graphics somewhat faster then the series IID.